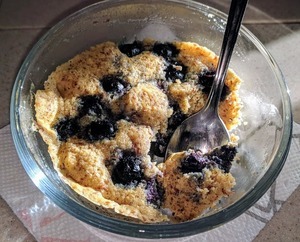 ​​I like to have an easy RV breakfast on moving day, and one way I do that is with gluten-free microwave mug muffins that can be ready start-to-finish in less than five minutes. To be honest, these aren’t just moving day fare. Tasty, filling, nutritious, AND easy? Who am I kidding … they’re on the menu several times each week. ​As with most of my RV kitchen creations, I can’t claim the original recipe as my own. 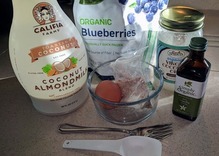 This one originated as the Healthy 1-Minute Blueberry Muffin from TheBigMansWorld.com. His blog is one of a few that I rely on for tasty recipes. If you’re not subscribed to his blog or following him on social media, you should be. My twist is a slight tweak on the ingredients and microwave method, as well as preparing enough mix ahead of time to keep us in one-scoop muffin mix for days on end. I’ve also found these to be easily adaptable to different ingredients. You’re not limited to blueberries. Use whatever fresh, frozen, or dried fruit you have on hand, or be a real breakfast rebel and add some chocolate chips. Melt 1 TBLSP coconut oil in a large mug or ramekin. (I use a 2-cup glass Anchor Hocking bowl because it does double duty as a storage container.) Tilt the mug and swirl carefully to coat the bottom and sides with oil. ​​Add the following wet ingredients to the oiled mug, quickly stirring after each addition, to incorporate before the oil solidifies. Add the dry ingredients and stir well. Top with a couple TBLSP frozen blueberries or fruit of your choice. Pop your mug in the microwave and cook until set. Depending on your microwave, it’ll take anywhere from 50 seconds to 2-1/2 minutes. Mine is an older, 800 watt model, and it takes 2-1/2 minutes. ​Okay, if you try these and enjoy them as much as we do, you can fill sandwich bags, each with enough dry ingredients for one muffin - then store in the fridge until use. I was making 10 bags at a time this way. Or you can mix up a bigger batch and then measure out a slightly rounded 1/4 cup of dry mix per muffin. Mix well and store in the refrigerator. Whenever you want a muffin, add a slightly rounded 1/4 cup of this dry mix to your wet ingredients and pop it in the microwave. Easy peasy - and hardly any cleanup! 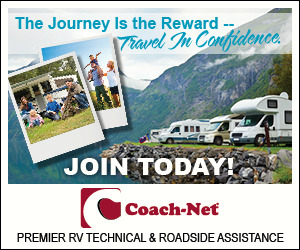 ​​Seriously, this is as easy as it gets for a quick and healthy, easy RV breakfast ​while you're packing up the RV to move to your next stop. 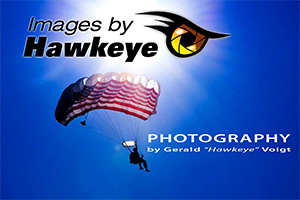 ​If you give it a try, please leave a comment and let us know ​what you think. ​​​​​​​​​What's your favorite go-to meal when you're on the road?